If you’ve ever taught someone to use SketchUp, you’ve probably drawn the basic SketchUp house and then breezed over the details when it comes to detailing the roof. The truth is that designing roofs is not always a straightforward task, even for experienced modelers. Draw Walls: Rather than outlining walls in a 2D view, and using Push/Pull to extrude them to full height, PLAN can draw complete 3D walls based on your desired dimensions. Each wall can be input as quickly as drawing a single line. Edit Walls: Even if you are precise when it comes to grouping objects and creating components, modifying walls in an existing structure can be a trying process. With walls created by BuildEdge PLAN, you can move one wall, and all of the attached walls (not to mention the roof) will stretch to stay connected. Model Roofs: Modeling a pitched roof in 3D is not a straightforward task. Properly projecting surfaces so that they intersect each-other to form a proper roof is time consuming, and if you want to model for framing, including proper heel heights and overhang geometry can be a challenge. BuildEdge PLAN simplifies the process by generating roof geometry from a simple roof outline. Just specify the slope and heel geometry of each side of the roof, and the plugin does the heavy lifting. 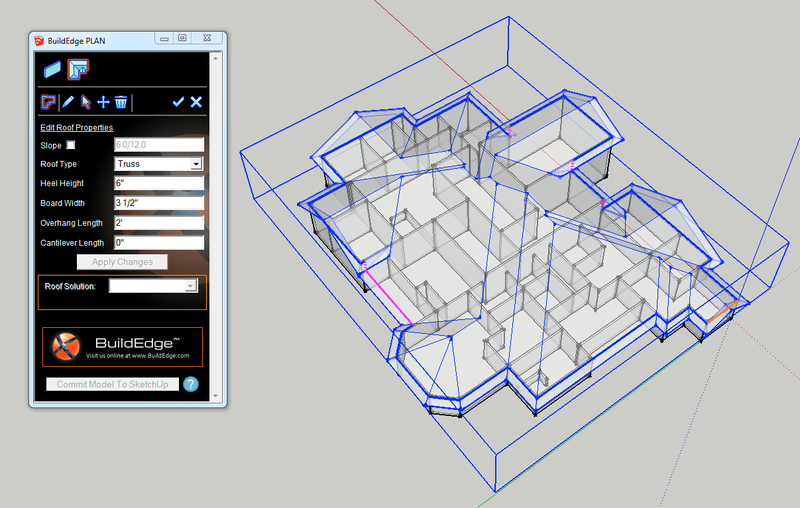 PLAN also lets you set properties of each roof side individually, so there is plenty of wiggle room for customization. Edit Roofs: Since BuildEdge PLAN recognizes walls and roofs as they are input, you can modify the house as a whole, and move walls or change properties of a roof on the fly. This allows you to quickly change the look of the entire house or any individual properties. For instance, switching from a hip to a gable is literally a single click. Currently, Build Edge PLAN is only available for PC (a Mac version is in the works). The folks at Build Edge have some quick tutorials to get you going and are pretty great about helping modelers to get the most out of their plugin; give it a try, and the next time you teach someone SketchUp, don’t skimp on the roof. The new technique of sketup rendering is really good and add some more features and you explaine it well well how to sketchup the plan, because any design based on sketup only. Hey wow, those guys are heroes. I own SketchUp Pro 8 for a Mac. I downloaded and installed PLAN Beta 1.0 (Mac OS X Mountain Lion) and now SketchUp crashes upon opening. I have attempted to contact Trimble SketchUp several times and I have yet to receive a response. I'm very disappointed. As we mentioned in the post, Build Edge PLAN is only available for PC at the moment. So you may be having issues trying to use the PC version on your Mac. Have you tried completely removing the BuildEdge plugin files from your plugins folder (On Mac: Library > Application Support > Google SketchUp 8 > SketchUp > plugins). Give that a try, and I'll check with our support team to make sure they've seen your E-mails (assuming you're using the Pro Contact form: http://support.google.com/sketchup/bin/request.py?contact_type=prouser). agree with your suggestion. I am very interested in this matter. Thanks for sharing this! Thank you for responding to my comment. Fortunately I was finally contacted and was able to reinstall SketchUp. However there no seems to be several glitches in the program that were not there previously. I am currently attempting to resolve these issues. On another note, I understand that the article said Build Edge PLAN was only available on PC but the hyperlink in the second paragraph (Build Edge PLAN,) took me to a page that had a download link for a Mac Beta version and that is where I downloaded the Build Edge PLAN plugin that has given me so much trouble and corrupted my SketchUp program. patio in perth after reading some comments from Sketchup. They truly has escalated art and of course architecture as well. Great share. We actually started using Build Edge for our roofing business. We're a leading Maine roofer, and a lot of our customers who are looking to build new homes or tear down an old damaged roof have benefited from us having this great tool. Just wish I could put it on my iPad and take it out in the field! Recently started using BuildEdge and can't imagine how I would ever go back. I'm a roofer in Massachusetts and am now encouraging all of my estimators to use BuildEdge for any new roof construction work. It's saving us a great deal of time and resources. Any idea when the version for Mac will be available? I use Apple products for everything else, including invoicing on my iPad. Would love to see this available for Macs too.